All these years, I had blissfully ignored videos during my travel. Almost everything I clicked was still photo and in few occasions where I made video, I never bothered to edit them and would upload as is. This is because video editing appeared as time consuming process. With the acquisition of GoPro, I ended up recording lots and lots of videos during the recent 2 trips- It was very easy to capture video- just press a button and point the camera in the direction you’d like to shoot. Without much of a planning or preparation or conceptualization, I made lots of random videos. These added up close to 40GB in size videos alone. There is no way I can upload all of these. Also half of them could be discarded right away, as they had no unique footage. From the remaining one, I had to extract best moments which are show worthy. Because of this, I had to start experimenting with video editing. My 5 year old Lenovo G550 with 3GB RAM with Core 2 Duo, which was hitherto all perfect, suddenly began to feel underpowered, as it couldn’t handle heavy duty video editing and would often crash. Video editing is a fairly time consuming process- in order to make a 2 min video worth watching, editor spends 2-4 hours or may be even more-first, one has to watch all the footage to find out clips that are worth presenting, then arrange these clips in a logical sequence such that it makes a continuous story, add titles, add audio, add special effect, try it out, compile, export, upload etc. Depending on length of the video, output format and your system config/internet connection, some of these activities can take very long time. So far I learnt how to edit a footage, add title and how to add an audio. Below are some of the first few videos I’ve edited. It looked like a big deal in the beginning, but after spending few minutes and understanding how the tool works, it isn’t that difficult. However, video editing still demands lots of patience and time. Since my computer doesn’t have best of the hardware, it takes time to load, process, export, upload etc. I am yet to master the art of introducing some animation/special effects, effective use of stills within a video (like pan, zoom in, zoom out) and other tricks often employed in video making. GoPro video doesn’t have zoom, so if I could add some closeup stills and give it a video effect, it would have been nice. But last night when I tried, I couldn’t do that (Had some issues, which I think I can sort out after some more attempts). Video 1: Masti in Jaisalmer- Full HD, 2 min video was about 350MB, took few hours to deal with it. Have used lot of still photos in this one. When I watched my own video in youtube it showed me in very poor quality and I was shocked. I sort of panicked, took another export in HD and uploaded afresh. 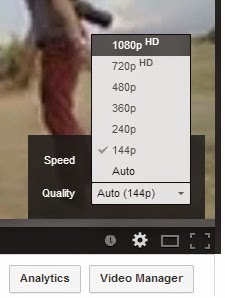 Later I realized that it was because of slow internet connection that youtube had decided to show me the video in poor quality and if I set 1080 HD or 700 HD, playback quality on youtube was decent. All the efforts put in editing and publishing the video will be fruitful if there’re enough viewers to it. And given that hours worth videos are being uploaded to youtube every minute, getting someone to spare their precious minutes to watch your video is more challenging than getting blog readers. I can’t expect too many views for my first few videos. At this point of time I am not sure if I should be spending lots of time on videos, as office work and blog keeps me busy for most of the time. But after some experience I hope video editing will be quick and I don’t have to spend lots of time editing the video. Another basic step would be to shoot less videos in the first place. Resist temptation of making video on anything and everything, apply some thought/planning and record only what’s possibly important. Something I need to keep in mind during future trips.